When I review an ejuice based on a type of food, I compare it to the flavor of that food. That’s actually one of the factors I use to score the ejuice, “taste authenticity.” If that ejuice is based on a type of food I enjoy but a flavor I haven’t tried I’ll usually go out and purchase that food to get an accurate comparison. Especially if it’s something I really enjoy, like a smoothie. 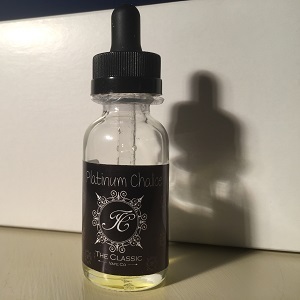 The Classic Vape Co sent a bottle of Platinum Chalice, one of the flavors in their Black Label line. With that description I figured I’d run out and get an actual blueberry, strawberry, banana and pineapple smoothie and see how close The Classic Vape Co got with Platinum Chalice. Problem was my local smoothie shop doesn’t have a blueberry, strawberry, banana and pineapple smoothie. So I went online and did what I thought would be a quick search. Two hours later it occurred to me that the mixologists at The Classic Vape Co must geniuses, franchise smoothie chefs are really missing out on something, or a little of both. No one has a blueberry, strawberry, banana and pineapple smoothie. At least no one that Google could find. Oh sure,there are blueberry, strawberry and banana smoothies, and strawberry, banana and pineapple smoothies, but not a single smoothie store combines all four of those fruit flavors. At least not on their published menus. Cowards. Like a well blended Smoothie, the flavors in Platinum Chalice are mixed so completely as to almost present an entirely new sensation. It’s a very fruity taste, with hints of strawberry and blueberry on the inhale and a glimmer of tangy pineapple on the exhale. The banana acts almost more as a texture than a flavor, serving to smooth the entire experience and take the sharpest edges off the rest of the fruits. Given the combination of flavors in Platinum Chalice, The Classic Vape Co could have easily described it as a fruit cocktail. But they were correct to use the term “Smoothie.” The vapor is incredibly smooth and leans to the cool side. The throat hit is in the medium range. And, like the flavor, the overall aroma is fruity with notes of the berries being slightly dominant. I vaped Platinum Chalice for three days and found it very refreshing. It’s not overly sweet, like some fruity vapes, but not too tart either. This is a nuanced, complex combination of fruit flavors that’s smooth and authentic. The Classic Vape Co offers Platinum Chalice in 15 ml, 30ml and 120 ml bottles for $7.95, $14.95 and $37.95. 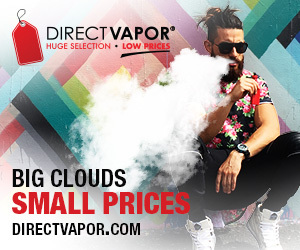 Available nicotine levels are 0 MG, 3 MG, 6 MG, 12 MG and 18 MG. They mix Platinum Chalice in a 30/70 PG/VG ratio. I vaped Platinum Chalice in a SMOK TFV8 on the Kangertech KBOX 160. 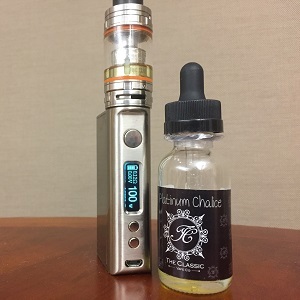 The Classic Vape Co provided the bottle of Platinum Chalice for the purpose of this review. Order Platinum Chalice from The Classic Vape Co.